Since I last looked at HubSpot’s Sales tool — way back when it was called Sidekick — the setup process has been made a little easier. My previous 10 step setup blog post has been trimmed down to just 5 here. But if you’re not entirely sure what HubSpot Sales (Sidekick?) is, you may still want to take a look at it anyway. 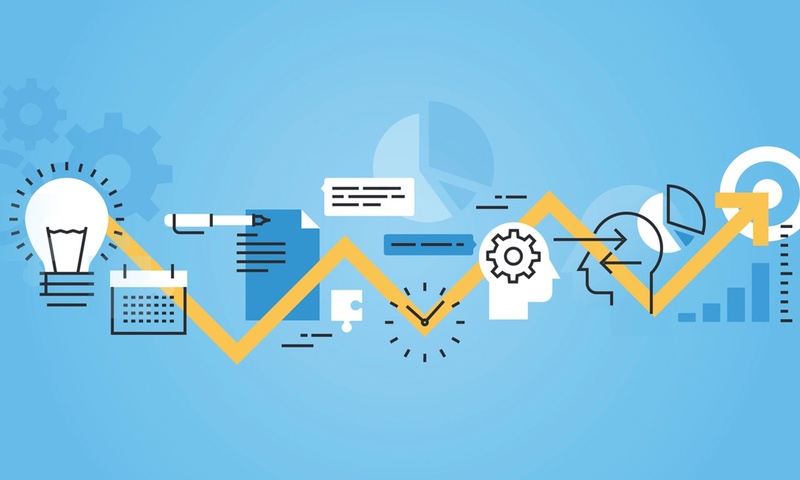 In short, HubSpot Sales, along with a collection of other powerful plug-ins, arms you with the information you need to compose more meaningful emails (and send them at exactly the right time). It’s aim? 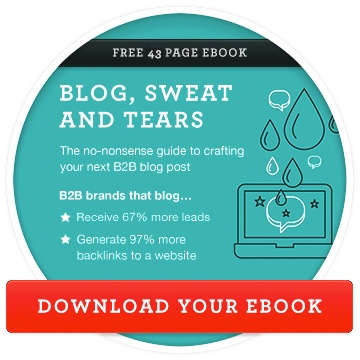 To help you close valuable leads with greater efficiency. Not only does it notify you when your contacts open or click on links in your emails, or are active on your website — but also pulls pertinent information into your inbox, such as their most recent posts to social media or their company details. Handy, right? There are two tiers, one free version to get you started, and a paid ($50 a month) Professional tier for when you’re seeing the benefits HubSpot Sales and need a little more power in your arsenal. The latter ups the number of notifications you can receive and adds additional tools like Sequences and placing calls right from within your browser — which are recorded and logged in HubSpot’s CRM too, of course! So without further ado, let's crack this can open and get you set up. You’ll be done in next to no time and reaping the rewards in less than fifteen minutes flat! The very first step is to either sign into HubSpot if you’re an existing user, or set yourself up as a new one. Navigate to https://app.hubspot.com/signup/sales to get started. If you’re already signed into HubSpot, your account should be detected automagically — otherwise you’ll be prompted for your email address, company name and website. If you have more than one HubSpot portal associated with your account you may be asked which one you want to set up for Sales. Usually this would be your primary portal that belongs to your company. Choosing the right one is important as it’s where all activity will be logged! You’ll be taken through a wizard that asks some simple questions to help you get setup quickly. Then you’ll be prompted to download and install the Chrome browser extension. This is the widget that works the email tracking magic, notifying you of opens and clicks within your emails, and when contacts land on your website. If you skip this step, you can always come back to it later by installing the extension from the Chrome Web Store — but it makes sense to do it now. So go ahead and install the extension. It’s worth mentioning that this extension also adds some functionality when sending emails with Gmail webmail. You’ll be able to use templates for emails you send regularly and see additional contact information when composing new ones — things like their social profiles and company details. If you’re not using Google Chrome (you prefer Firefox or Safari, perhaps) and are on Windows, you’re in luck. 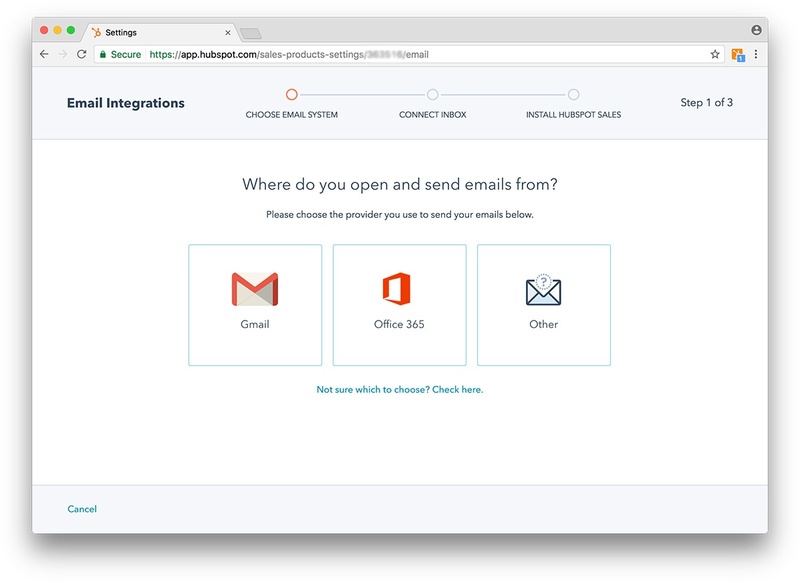 HubSpot have created an app for Windows that enables you to still receive the instant notifications for opens and clicks on links in your emails. Download it from here and double click on the installer icon. The app will be added to your tray (by the clock, bottom right 😉) where you can pause notifications if they get a bit much! Step 3: Not cruising on Chrome? Now we’ll add the same functionality to Outlook that the Chrome extension gets you in Gmail — your contacts’ profile information right in your inbox, so you can view it easily when composing new emails. Download the Outlook plug-in from here, run the installer and be sure to restart Outlook. 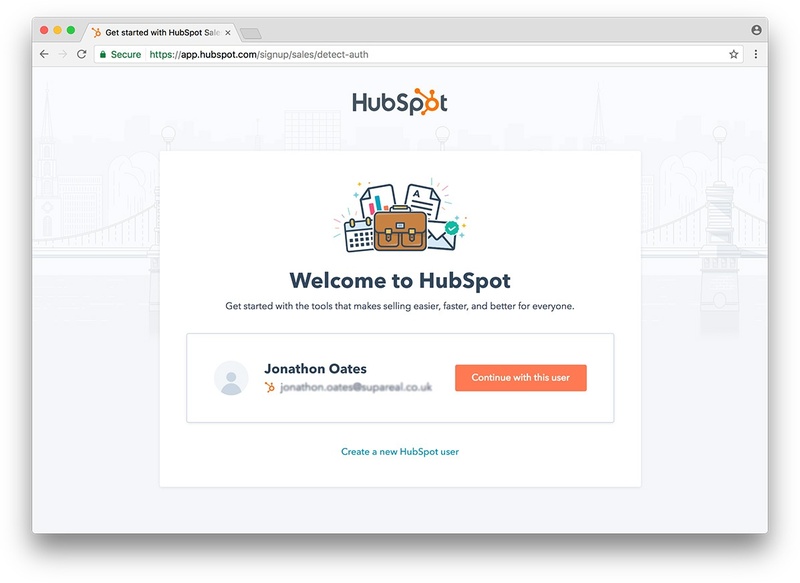 You’ll be asked to login with your HubSpot Sales account (from step one) and should see the plug-in appear (usually top right) in the ribbon. 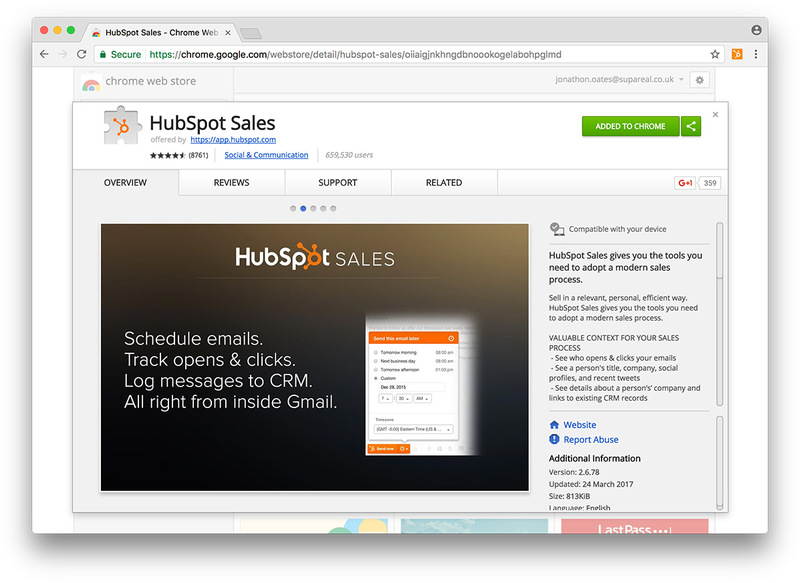 If you’re using Gmail or Outlook 365 webmail, you’ll want to authorise HubSpot Sales to log activity and track email in the CRM too. 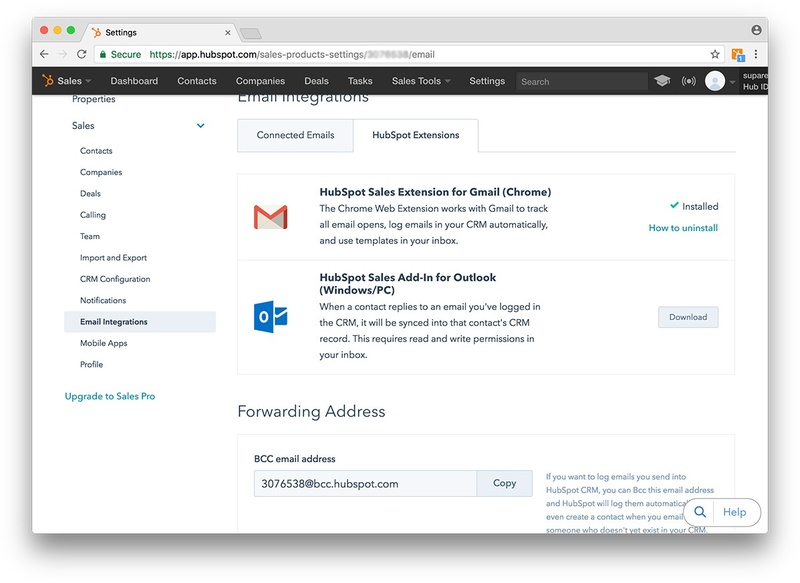 Navigate to https://app.hubspot.com/sales-products-settings and in the left hand menu choose ‘Email Integrations’, then ‘Connect your email’. Select either Gmail or Outlook 365 —depending on your preference — and read the popup notification. 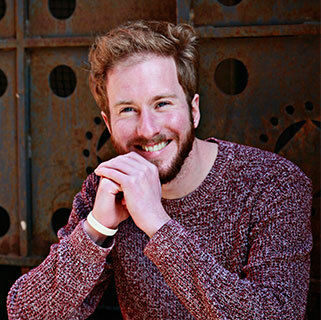 It’s important, and tells you what HubSpot wants access to. Then continue to connect your email with the click of a button. Simple. Now we’re very nearly there, so hang tight! Next, send an email to hello@getsidekick.com from either Gmail or Outlook to test things out. Shortly after you *should* get a notification telling you it was opened. If not, post any questions to the comments and I’ll be sure to help you out! All that’s left now is to customise what you do and don’t want to see in your notifications and take note of a couple of email addresses you may want to make use of later on. Click on ‘HubSpot Extensions’ tab and skip down to the Forwarding Addresses section. You won’t use the first two addresses (they’re actually the same, really) too often — all your emails will be logged in the CRM automatically if you’ve followed the previous steps. But if you ever find yourself needing to log emails you’re sending from other devices (your phone or colleague’s computer, for example) you can BCC in the CRM and HubSpot will even create the contact if they doesn’t exist already 👍. The next email address can be used to forward incoming emails to the CRM and log them against the sender’s contact record. What’s more, your replies will be logged automatically. Now don’t get me wrong, I love this tool. But all these notifications can get a bit much! You probably only want to see when your own contacts visit your website and landing pages. So, scroll down to ‘Lead Revisit Notifications’ where you can choose to see all revisits, just your own contacts,or turn it off entirely and just get notified of email interactions; opens and clicks, etc. Having successfully completed these five steps, you’re good to go. 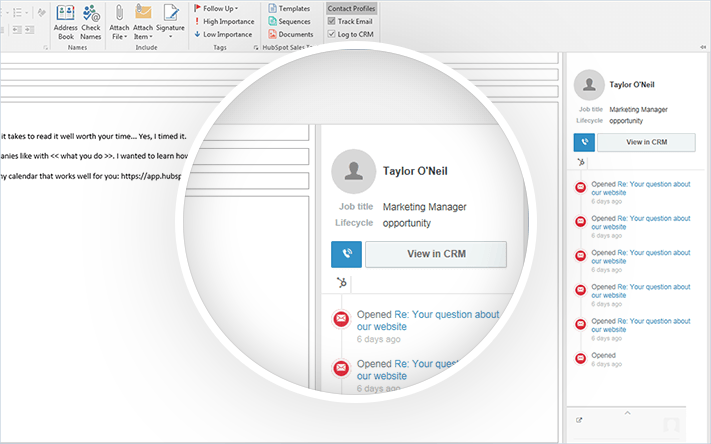 Emails should sync seamlessly with the CRM and new records created for contacts who aren’t already in there. On the free tier of HubSpot Sales you’re technically limited to 200 notifications so you may want to turn them off as per the above unless you’re a Pro user. Tune in again for when I deep-dive into the full feature-set of HubSpot Sales tools, from Templates to Sequences, Scheduling emails and more. Hopefully you’ve gotten through these five steps without a hitch, but please feel free to post questions to the comments and I’ll do my best help you out.